@Nicole, I am happy to report that our team's Zendesk administrator figured out a way to automatically ingest (keyword) activity, i.e., a new post or a new comment, on our Community directly into our Agent's tickets. I don't have details about the exact tools and workflow she created, but my understanding is that she created a dummy GSuite email address, subscribed to all of the topics in the Community, and then used Gmail scripting to change the Community Activity Email Notification's reply-to address. The latest activity notification in a thread is then forwarded once every hour to our support request email address. It has saved us countless hours of work since she implemented the system and it allows us to manage all incoming requests, both tickets and new comments on the Community, in a single place. A major limitation of the system is that agents have to go to the Community to respond but it's much easier than relying on two different tools. She is willing to share more details if anyone is interested in learning about what she did. Thanks for sharing, Andrew. That's definitely an interesting way to do it! I'm going to pass that along to our dev team. 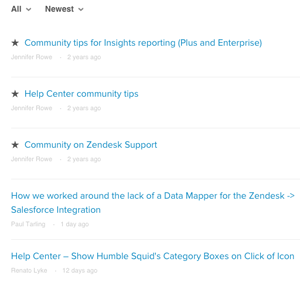 Any updates on this article https://support.zendesk.com/hc/en-us/articles/215456047-Customizing-status-icons-for-Community-posts. We made this change a while back, and I need to go in and update it but need to reference the documentation to do so. No update at this time...we need to wait until someone is available to revamp the article. I'll check in on it and make sure it's still on the radar! Good news--the Customizing status icons tip has been updated and is available again! 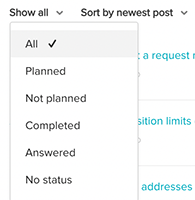 Is it possible to know the exact meaning of the existing post's status (planned, not planned, completed) and what are they doing to a post once selected (closing it for comment or post ...) ? Our Mgt team would like the following metrics on the Zendesk Communities. Do you have suggestions on how to gather this information? 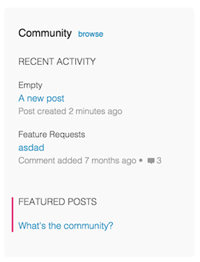 If I use the Reporting --> Community, I am limited as to what metrics are available. Also, for # Views, does that represent anyone accessing a community including bots, internal users, etc. Does anyone have an example of using the API to extract all community posts and output this information into a csv or excel file? This way we can use pivot tables to manipulate the data to get various metrics on the communities: # of participants, # posts to each topic, # comments to each post, etc. When I try to run Curl, I can get the data but cannot figure out how to dump into a csv file for excel to open. Hopefully someone can get back to you with some API examples! In the meantime I've attached our Help Center API Documentation for listing posts on your account. Additionally, there's no way to report on Community data within Insights so your best option will likely be to use Google Analytics instead to capture this information.